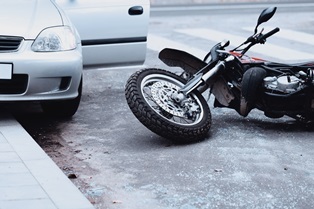 Motorcycle accidents involving car doors opening unexpectedly are surprisingly common and can result in severe injuries. If you've been injured in this type of motorcycle accident, you can file a personal injury claim to seek compensation for your accident-related expenses. Right-hand maneuvers can place a motorcycle very close to parked vehicles, since bikers are required to move to the right side of the traffic lane before a right-hand turn. Illegally parked vehicles can open doors too close to traffic. Drivers may fail to check their side and rear-view mirrors before opening a car door. Drivers distracted by other vehicle occupants may not see a biker approaching. Poor weather conditions can impede visibility. Road debris, other vehicles, or conditions that make a biker veer toward a parked vehicle can create the opportunity for a collision. Even if a motorcyclist is able to avoid colliding with an open car door, he may still suffer injuries from the evasive action. If he runs into a tree, curb, sign, or other object to avoid a more serious accident, this can still be the basis of a personal injury claim since the loss of control was due to the need to avoid striking an open car door. Motorcyclists who are determined to be partially at fault for their injuries can still receive personal injury compensation under Louisiana law. However, their settlement will be reduced by their assigned percentage of fault to reflect their role in the accident. Since helmets are required by law, note that failing to wear a helmet will make you partially at fault for the accident. However, if you did not suffer a head injury, your failure to wear a helmet will be considered legally irrelevant since the helmet would not have prevented your injuries. The defendant had a duty to act in a way that reduced the risk of injury to others who were sharing the road. The defendant acted in a way that breached this duty. The victim suffered specific injuries. The injuries are the result of the defendant's actions. Reports from law enforcement, photographs of the accident scene, witness testimony, and copies of your medical records are some of the types of evidence that can be used to support your claim. Expert witnesses can also be called to testify on specific aspects of the case such as how your injuries have affected your future earning potential and the type of medical care you might require in the future due to an accident-related disability.